Plus, Indian defense coproduction, India-Pakistan relations, the JSDF in 2015, and more. Year-end links. It’s no secret that Russia is facing trying times economically amid tumbling oil prices and Western sanctions for its behavior in Ukraine. 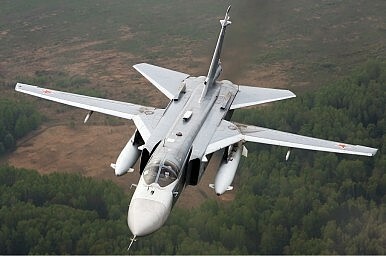 According to a report in Defense News, Russia is looking to avert a food shortage by leasing 12 Sukhoi Su-24 Fencer aircraft to Argentina in exchange for beef and wheat. Suggestions that a deal could be in works have prompted the British Defense Ministry to study the air defense preparedness of the Falkland Islands. “The MoD undertakes regular assessments of potential military threats to the Falkland Islands to ensure that we retain an appropriate level of defensive capability to address any threats. We continue to remain vigilant and committed to the protection of the Falkland Islanders,” it said in a statement. India is pursuing its defense coproduction ambitions seriously. Recent reports suggest that the Indian Defense Ministry has decided that if either South Korea or Russia will participate in competition for a helicopter production contract, they must partner with domestic Indian firms for production. The Russian offer is for Ka-226 multi-role helicopters and was made during Vladimir Putin’s visit to New Delhi in early December. South Korea is offering its Surion light utility helicopter (LUH). India and Pakistan enter the new year on an ominous note after trading fire across their ceasefire line in Kashmir, killing one Indian soldier and wounding two Pakistani soldiers. Relations between the two nose-dived after the Indian government cancelled foreign secretary-level talks after Pakistan’s ambassador to India spoke with a Kashmiri separatist leader. The two sides have since witnessed a decline in bilateral relations with ceasefire violations becoming a regular occurrence as in 2013. Heading into 2015, the India-Pakistan flashpoint will be one to keep an eye on. The coming year will mark the 70th year since the end of the Second World War, and, as two authors suggest in The Japan Times, a “turning point” for Japan’s Self-Defense Forces. Although Japanese Prime Minister Shinzo Abe won the December snap election largely on the basis of a low voter turnout and his party’s overall dominance owing to a weak opposition, the victory will allow him to continue to push through both evolutionary and revolutionary changes to Japan’s military. Keep an eye on the SDF’s operational expansion beyond the Northeast Asian region in 2015 as per the Japanese government’s relatively recent reinterpretation of the constitutional ban on collective self-defense. China and Thailand agreed to expand their defense cooperation last week, signaling grown ties. Chinese Premier Li Keqiang met Thai Prime Minister Prayuth Chan-ocha, the general who led a bloodless coup against the Thai government in May 2014. Bangladesh and Brunei are scoping out closer defense ties. Both countries have said that they will prioritize closer defense relations in 2015. And lastly, a very happy New Year to all Flashpoints readers. Between India and Pakistan, Can 'Negative Peace' Serve as a Strategic Good?Pulwama, Balakot—What Next? Escalation Risks and the India-Pakistan CrisisIndian Air Force Strikes Pakistan-Based Terror Camp in ‘Preemptive Action’New Terror Attack Exposes India’s Limited OptionsCan the SCO Bring India and Pakistan Together?